Silver to Steel situates Peter Muller-Munk (1904–1967), a German émigré to the US, among the most influential designers of his generation. With more than 120 works of hand-wrought silver and popular mid-century products, supported by drawings, multimedia interviews, and period advertising, this exhibition presents the untold story of a man who rose from anonymity as a young silversmith at Tiffany & Co. to become a crucial postwar designer and founder of one of the top design consultancies in America: Peter Muller-Munk Associates (PMMA). Beginning with Muller-Munk’s remarkable Art Deco silver, the exhibition also features his best-known designs: the streamlined Normandie pitcher and Waring waterfall blender. But the revelation comes in his previously undocumented work: cameras, radios, cocktail shakers, power tools, and refrigerators; and total environments for gas stations, international expositions, and mass-transit vehicles. PMMA’s contributions to public projects like the famous Unisphere for the 1964 World’s Fair have been overlooked for decades. The firm counted Alcoa, Bayer, Bell & Howell, Bissell, Mellon Bank, Pittsburgh-Corning, Silex, SOHIO, Texaco, US Steel, Waring, and Westinghouse among its scores of national clients. 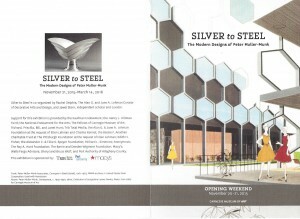 Silver to Steel reestablishes Muller-Munk’s position as one of the preeminent industrial designers of the mid-20th century and provides visitors the opportunity to explore the impact of good design on everyday life.